Niamh Sammon, the director behind the new documentary Rome v Republic, explains what prompted Senator Michael McDowell to analyse the relationship between the Catholic church and Irish state. Watch Rome v Republic here, via RTÉ Player. In March 2017, a newspaper column by Senator Michael McDowell caught the eye of an RTÉ commissioning editor. Following a particularly over-the-top Dáil performance by the then Taoiseach, Enda Kenny, on the subject of the Tuam Mother and Babies scandal, Senator McDowell asked why politicians felt the need to engage in the rhetoric of "competitive moral outrage" when it came to dealing with church scandals. Outrage is understandable when we think of such scandals, but Senator McDowell pointed out that outrage alone does not add to the process of uncovering the truth, nor of learning from the uncovered truth. Here was the germ of a compelling idea. How had the church, and Irish society, come to the point where pregnant unmarried girls were banished from their communities to distant convents for the period of their confinement? Why was the avoidance of scandal such a compelling force in Irish life – and how was it that the church had come to exert such total control over public and private morality, for so long? Michael was immediately interested in the idea of working on a documentary which would uncover this remarkable story. Funding was the next hurdle. Pat Sammon, a gifted writer, brought Michael’s ideas together in a compelling proposal which persuaded the Broadcasting Authority of Ireland to come on board. With funding secured I started production with a terrific team that included producer Yvonne Nolan, production manager Lucia Gavin, director of photography Richard Kendrick, camera assistant Tom Reynolds and soundman Mick Cassidy. Nick Norton-Smith composed a wonderful soundtrack that fits seamlessly with the programme. And the brilliant editor, John Murphy, brought the very best out of the material raising the documentary to another level. Our starting point was in Paris. We wanted to challenge the viewer to see the revolutionary era in Europe, beginning in the French capital in 1789 with the Declaration of the Rights of Man, as the starting point of the bloody birth of the modern relationship between the Catholic Church and the Irish state. Why was this? Theobald Wolfe Tone, a man of the Enlightenment and one of the leaders of the United Irishmen, had come to Paris in 1796 with a bold and daring plan to create a Republic along French lines. Traveling under an alias – Paris was full of spies – he asked the French government to send a force of invaders to overthrow British rule and declare the Republic of which he dreamed. We travelled to Paris in July 2018, to recreate this remarkable story, filming at the Jardins de Luxembourg – where Tone was walking when he heard the news that the French would support the Irish cause. 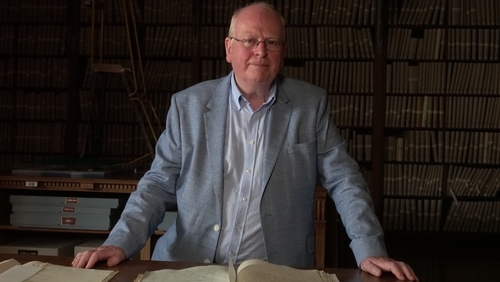 In a stiflingly hot room in the French National Archives, we interviewed the world-renowned Tone expert, Professor Marianne Elliott, who showed us one of the most important documents in Irish Republican history:– Tone’s memorandum to the French Directory. This was the decisive moment in church-state relations in Ireland. Both the British Crown and the Catholic church reviled the notion of a republic, and now the threat of revolution reconciled these age-old enemies. The French did land in Ireland but Tone was arrested, court-martialled and sentenced to death. His dream of a republic died with him. The deal that bound the British Crown and the Catholic Church was the Crown’s agreement to fund the building of a Catholic seminary for priests in Maynooth. When I first discovered this fact my mind boggled:– it’s extraordinary to think of the Protestant British state funding a training ground for Catholic priests. In St Patrick’s library, we filmed a letter from the Catholic archbishop of Dublin to the British Lord Lieutenant asking for money for the seminary. Throughout the 19th century, these unlikely allies continued to work together to crush militant republicanism in Ireland. We travelled to Rome to tell the story of how Cardinal Paul Cullen, a farmer’s son from County Kildare, lead the transformation of the church in the 1850s. Cullen had spent the greater part of his life in the papal city, and on his return to Ireland in 1849 he set about turning Irish Catholics into Roman Catholics. Across Ireland, you can still see Cullen’s imprint on our lives in the form of schools, convents and the church spires that dominate the landscape. In Rome, we also met former Irish President Mary McAleese, an authority of church history and canon law, who shared with us her views on how the institutional Catholic church has lost its way. Our filming took us to many parts of Ireland to visit churches and archives. As with any documentary, our work is so dependent on the help and cooperation of everyone we come into contact with. Hopefully, the programme will generate discussion and debate over the kind of Republic we now want to live in. Niamh Sammon is the director of Rome v Republic which is now on RTÉ Player.